Silver Guru Calls Recent Market Action the "Real Deal"
Silver Shorts Squeezed As Guru Calls Rally "Real Deal"
Look out, silver shorts! Silver prices opened higher this morning after they posted their biggest weekly percentage gain in nearly five years. A "short squeeze" is underway as speculative short sellers scramble to cover their positions. The fireworks in silver occurred despite a lack of any major market-moving news items. The currency markets were also relatively quiet. The U.S. Dollar Index ended up slightly positive (+0.2%) for the week. Silver's surge can be attributed to pent-up imbalances in the futures market, released after silver posted a weekly close above $20/oz the previous week. The market itself was the catalyst. Commercial traders (usually a leading indicator) held near-record numbers of long positions, while hedge funds remained aggressively short. No surprise – the commercials are again getting the better end of the trade. The backs of the shorts may finally be broken. As we enter a period of seasonal strength for precious metals, conditions look favorable for this rally to continue. In order to prove that the precious metals rally is no fluke, traders will be looking for gold to confirm silver's advance by closing above the $1,400/oz resistance level. Was last week's silver surge a fleeting bout of short covering or the start of something big? In Friday's Weekly Market Wrap podcast, renowned silver expert David Morgan shared his insights with us. He thinks the rally is the "real deal." "Yeah, this is the real deal," Morgan said. "Is there still time to get on? Absolutely. I mean, I'm going to stick to what I said probably a year ago – if you could buy under $30, do it. "...I know that there are a lot out there that bought at $30 and they probably bought from Money Metals and they're not happy because we're just at the $22 [to $23] level right now. 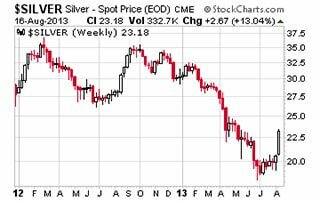 If you go out four or five years and you can tell you friends and colleagues you bought silver at $30 you will be very happy to announce that price from the aspect of where we're going to be, again, four or five years out." Demand for silver coins nationwide continues on a record-setting pace. Silver American Eagles sales for the year climbed above 31 million last Tuesday, according to U.S. Mint reports. Previously, the earliest in the calendar that figure had ever been reached was September 23rd (of 2011). 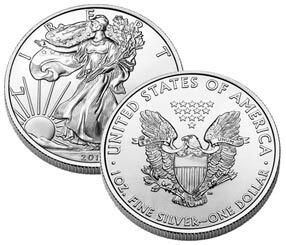 Although Silver Eagles are a popular choice among investors, premiums on them remain somewhat elevated. 10-oz and 100-oz bars, along with silver Maple Leafs, silver Philharmonics and privately minted 1-oz rounds may offer better value at this time. A relatively light news week awaits investors, as Congress remains in recess until September. The main item of focus will be Wednesday's release of Federal Reserve meeting notes. Wednesday, Aug. 21st – July FOMC Minutes. Investors will get a look at minutes from the July Fed meeting. Markets could react on any hints of whether Ben Bernanke and company will taper their Quantitative Easing program in September. Thursday, Aug. 22nd – PMI Market Flash Manufacturing Index; Weekly Jobless Claims. Evidence of a weakening economy and job market would reduce the odds of any significant Fed tapering in the near future.